Federal agencies increasingly recognize the importance of active risk management to help ensure that they can carry out their missions. High impact events, once thought to occur only rarely, now occur with surprising frequency. 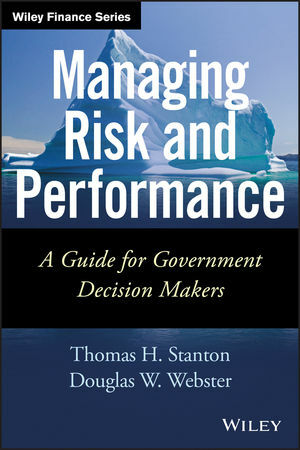 Managing Risk in Government Agencies and Programs provides insight into the increasingly critical role of effective risk management, while offering analytical tools and promising practices that can help improve the quality of risk management in government organizations. Showing government officials how to improve their organization's risk management capabilities, Managing Risk in Government Agencies and Programs meets a growing demand from federal departments and agencies that find themselves increasingly embarrassed by risky events that raise questions about their ability to carry out their missions. THOMAS H. STANTON teaches at Johns Hopkins University. He is President-Elect of the Association of Federal Enterprise Risk Management (AFERM) and a Fellow of the National Academy of Public Administration. Mr. Stanton is a former member of the Federal Senior Executive Service. He holds a Bachelor of Arts degree from the University of CaliforniaDavis, a Master of Arts from Yale University, and a Juris Doctor from Harvard Law School and has written extensively on governance and risk management in the financial crisis. DOUGLAS W. WEBSTER is the Founder and President of the Cambio Consulting Group, LLC, and co-founder and past President of the Association of Federal Enterprise Risk Management (AFERM). He served as Chief Financial Officer of the U.S. Department of Labor in 20082009 and has 20 years of experience consulting to over two dozen federal and state agencies. Dr. Webster received a Bachelor of Science in Engineering from the University of CaliforniaLos Angeles, a Master of Science in Systems Management from the University of Southern California, and a Doctorate in Business Administration from United States International University.